Pesto is one of those kitchen things we find ourselves going back to very often. It is so quick to make and absolutely delicious. We love it swirled up on pasta, mixed in rice or spread over warm bread... We always make our own and, when there isn't much basil - because, to be honest, our basil plants tend to disappear into our plates way too early -, we do it with whatever plant is happily growing in the garden. That's one of the great things about pesto! You can make it with practically any edible plant you have - broccoli, watercress, mint, nettles, even peppers, the list in endless. The other parts will be olive oil, lots of garlic, any kind of nuts and a bit of good hard cheese. You can play around with these ingredients until finding a mix that pleases you. 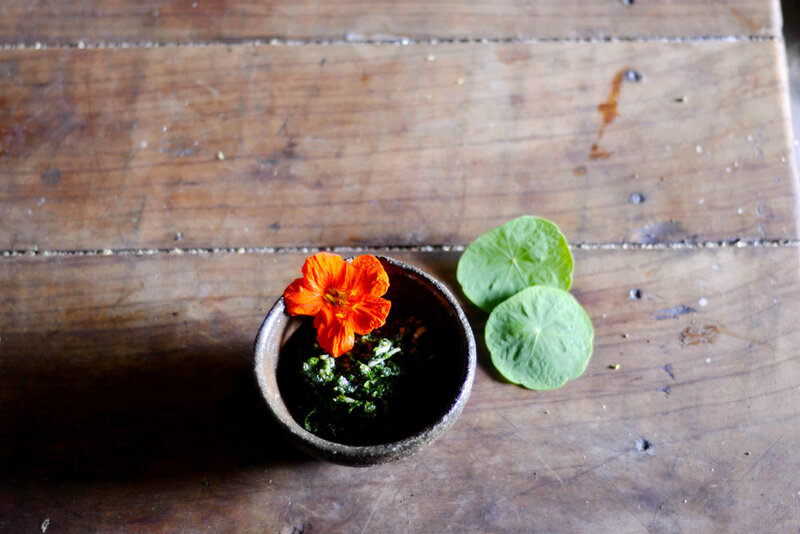 Some time ago, though, I stumbled across a recipe from Maegen, based on... Nasturtiums. It got me intrigued, and when I'm intrigued by things I tend to try them. Good heavens! Just cut everything together really thin, be generous with the olive oil and voilà. Be creative and add a pinch of whatever is missing. Thank you so much for the inspiration, Maegen! This was our first year actually using them green. Last year a lot of them didn't get ripe either, but the frost arrived before we could. Green tomatoes have this thing - you're not really supposed to eat them raw because of a toxin they contain, but once cooked they're perfectly safe. And taste so good! I'm a newbie at chutney making, so after looking at some recipes got the basic of it and switched the foreign ingredients for good old local stuff (just couldn't get around the sugar! Ugh). Also, I didn't measure anything at all. You can follow these indications if you want to try it out, it's really just a rough draft. And you can change the things you don't have for some local goodness! Cut the ingredient roughly - they will all break down anyway. I started by sautéeing the onions with a wee bit of olive oil before adding the tomatoes. And then... Patience. Let it cook, and cook, and cook, slowly, with the lid on. The tomatoes will release all the water you need, so don't add any! Stir every once in a while. After about 40 minutes I took the lid out to allow it to reduce. It got slightly brown - I guess I could have waited to get it darker, but I was very pleased with the taste already. Meanwhile, get all your jars cleaned and sterilized and ready to receive the hot stuff. Pour in the mix and seal the jars in boiling water. Ta-da! Don't forget that it tastes even better after a couple months. I made three batches of this and we must have around 25 jars. Hopefully will keep us warm during winter. You can see some of them lining up on top of the wall in this picture - yes we need more storing space. And that's the stewpot I used to cook the chutney over the stove. The pleasure of clack-opening a jar of something you made, during the cold season, is incomparable. It makes you feel slightly self-sufficient, capable and oh so empowered! This recipe could also be called "millet breakfast bowl for those who are eagerly awaiting for summer's fruits but meanwhile have to stick with last autumn's dried forages", but that would sum up too much. Today is a windy cloudy day on the mountains and we needed something warm and comforting in our bellies. The most abundant thing in our pantry right now are the nuts from last year, so nothing better than using those for a filling warm breakfast. The softness of the chestnuts combine so well with the texture of the millet. It was a perfect surprise to start the day. Last week we started adding new beds to the vegetable garden - we really needed more growing space, and lazy gardeners like we are, raised beds are always the right answer. So this time, instead of our typical hugelkultur, we're trying Charles Dowding inspired beds (I say inspired because we Sam did dig a bit before layering up). A good mix and layering of soil and horse dung (that good old store-bought highly-diluted horse dung... mmm...), topped with newspaper and mulch. There are now onions and kohlrabi happily growing in this one, and we're super excited about seeing the results! 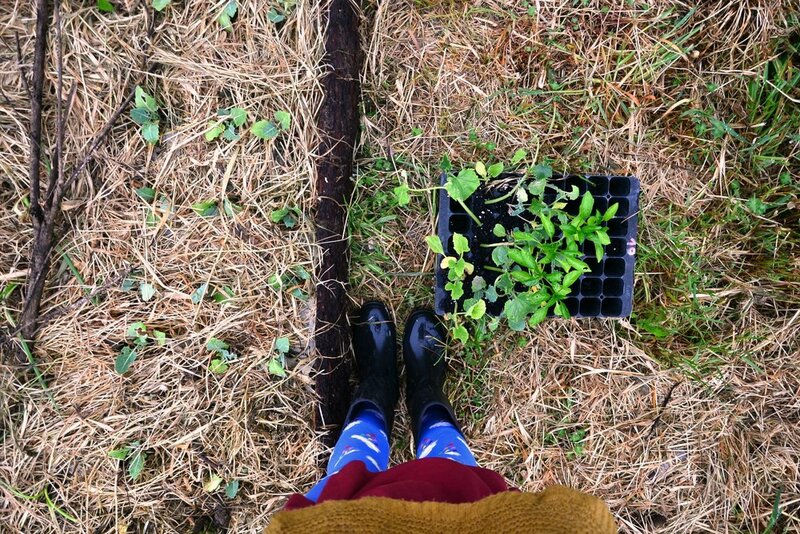 Hugelkultur VS wood-framed raised beds, bets starting in three, two, one...! Good morning! As I was looking through some photos from last year, found these from when we made a quick dose of turmeric paste, and decided to share it with you. Whenever one of us is sick, turmeric is the thing we always reach out for. Besides being an amazing anti-inflammatory, it has also been shown to work as anti-tumor, antibacterial, and antimicrobial. Making a paste out of it is a good way to keep turmeric at reach and quick to use, either in cooking or in teas and smoothies. Mix all the ingredients and stir it on medium-heat for about 5 minutes, until a bit thick. Then store it, and voilà! If you have a fridge, you should store it inside and it will last a couple weeks. After making this one, as we don't have a fridge, it quickly turned. So I'm thinking next time I will do it with olive oil instead to preserve it for longer! Or, even better, coconut oil!